To learn more, check out our Instagram, Facebook, Twitter. Tag @atollaskinlab in your #myatolla shots! If your face often feels greasy or looks shiny, chances are you might be experiencing oily skin. But wouldn’t it be great to know for sure? Or how oily is it, exactly - a normal amount, a more than normal amount? Capturing skin under an “oily” archetype isn’t super helpful. So let’s talk about oily skin: why it happens and how Atolla can help. When it comes to the condition of your skin, “oiliness” is due to the production of too much sebum. Conversely, dry, red, or flaky skin is, in general, the result of less sebum production. So what is sebum? It’s a substance excreted by the skin (specifically the sebaceous glands) naturally to keep it healthy and moisturized. It’s made up of triglycerides, free fatty acids, wax esters, squalene, cholesterol esters, and cholesterol. The oil found on the surface of your skin contains sebum, plus lipids from skin cells, sweat, and environmental substances that vary depending on where you are (which is why understanding and measuring your environment is important to understanding your skin). The oil level of your skin can also depend on your genetics, age, medications, environment and the time of year. Excessive sebum has a genetic component but also depends on age (skin typically produces less sebum as you age), where you live, what medication you’re on, and time of year all play a role. Oily skin can also be made worse by using the wrong products. When deciding to tackle your oily skin, it’s important first to determine what is actually going on. The Atolla System includes tools for testing oil, moisture, and pH, plus it tracks your skin by the season, environmental factors, lifestyle, etc. But skin isn’t simple. Believe it or not, oily skin can still be dehydrated skin. In fact, over 50% of Atolla beta customers in the Northeast US had this type of skin in the winter. Atolla can also help you test your exact oil levels to see where you fall, and how you compare to other people. 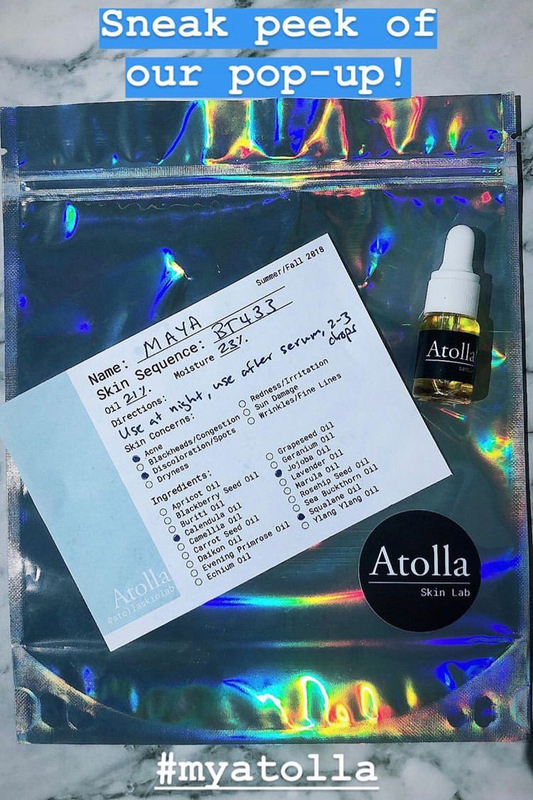 After the Atolla Analysis Kit analyzes your skin, a serum is created to give your skin what it needs to keep balanced and keep excessive oil at bay. Use a salicylic acid-based cleanser, or oil-absorbing lotion and lay off heavy night creams or balms that add extra oil (so look for hyaluronic acid, glycerin, and dimethicone as ingredients). Clay masks can help reduce grease and clear out pores. It can be tempting to pick, but don’t touch your face during the day as it can spread dirt and bacteria from your hands onto your face. Wash your face morning and night, and after any exercise. Want to get to the bottom of your oily skin? Join the waitlist to be the first to hear official launch news. There are almost 8 billion people in the world. Who decided there were only 4 skin types (normal, dry, combination, and oily)? If you’re not really sure about which skin type you fall under, rest assured, it’s because (cue dramatic music), there’s no such thing. More specifically, there are way more than four skin types. The myth of the four skin types is largely thanks to traditional skincare manufacturing. When formulating skincare products for the mass market, manufacturers strike a balance between what is most economically feasible to produce, relative to the number of products in the market and the number of customers they can attract. Read: it's the quickest and easiest to create products that fit into four archetypes. Products are formulated to accommodate the largest possible group, resulting in generic, misleading claims - and the proliferation of skin “type” based products. Occasionally skincare brands will go beyond the four main categories, to indicate if a product is for skin that is acne prone, sensitive, sun sensitive, allergic, has poor texture, large pores, etc. There are more nuanced classifications that dermatologists use, but these four are the ones you’re most likely to see on shelves. But in reality, skin is so much more complex than this. A lot of people think their skin has never changed, and purchase skincare as if it’s the same as it was in high school! (a la needing “oil-free” products). But, to keep healthy, our skin changes and regenerates throughout our lives. Plus, just about anything can trigger skin changes - stress, diet, hormones, pregnancy, weather, aging - the list goes on. As a result, most people experience oiliness and dryness at different times in their lives, sometimes simultaneously. We’re not really “one-size fits all” people, and our skin shouldn’t be treated in the same way. We believe people need and want truly personalized skincare products, tuned in to changing and unique skin needs, not those made for fictional archetypes. Instead of a skin type, we help determine your Skin Sequence. And get this: there are thousands of possibilities for Skin Sequences, based on your unique skin. And your skin sequence will change as you change. To crack your skin code and determine your Skin Sequence, we don’t simply rely on a multiple choice quiz. Instead, Atolla looks to real data. We measure the moisture, oil, and pH levels of your skin. To truly understand what’s going on, Atolla tracks these three key measurements to prevent and treat any caused by an imbalance. Why these three? Moisture: Without proper hydration, skin is more susceptible to redness, irritation, and unwanted hyperpigmentation. Oil: Your skin’s oil protects it from the environment, but excess oil can lead to clogged pores, breakouts, and blackheads. pH: Our skin's pH reflects how susceptible it is to bacteria, allergens, and pollution. By tracking your skin's pH, we make sure your skincare routine helps you stay in the optimal range of 4.5 - 5.5. Combined with an intake survey (environment, lifestyle, current routine, self-reported top skin concerns) and Fitzpatrick skin type classification (how your skin reacts to the sun), your Skin Sequence is born. The next, super exciting step is to formulate your personalized serum based on your skin data. But that’s not the end. Skin is always changing, so we continue to analyze your skin, track its health, and adjust your serum monthly. As our community grows, we’ll provide extra insights based on people with similar Skin Sequences, and you can connect with other users to share tips. What’s your Skin Sequence? Sign up to stay updated about our official launch, coming Spring 2019. Wow, 2018 has been an incredible year for us! A sincere thank you to everyone who supported us on our journey of taking Atolla from a grad school idea at MIT to a full-fledged business, closing the year with close to 1,000 early customers! It’s been a year of incredibly hard work. We went through the MIT Delta V accelerator, ran a 1-month pop-up in Soho, launched a Kickstarter, and released a beta version of our at-home skin testing app! We have no doubt 2019 is going to be even bigger and better. Most brands classify skin types into four categories: normal, dry, oily or combination skin. However, most people experience several those skin conditions (sometimes simultaneously) over the course of their lifetime dependent on their environment, the products they use, and their lifestyle choices. By understanding why measuring moisture and oil are important for taking care of our skin, we can understand how to properly tackle issues caused by any imbalance. Skin hydration is key to understanding and measuring the impact of cleansing (which often strip skin of hydration) and moisturizing products. Along with hydration, the measurement of skin’s sebum is an important factor into individuals’ skin characteristics. Different parts of the face have different amounts of sebaceous glands, which product sebum, and can appear oilier. Acne is a common consequence of too much sebum production. Thus, hydration and oil are related but not one in the same - oily skin can also be dehydrated skin. Your skin is your body’s largest organ, helping protect and regulate the body. Your skin’s moisture and oil levels reflect how well that organ is functioning. To best determine what products and lifestyle choices are best for our skin, we should regularly measure our skin’s moisture and oil level. Check out the Atolla Skincare System! Atolla pinpoints the cause of a skin issue and provides consumers with a personalized solution to solve it. Our machine learning platform understands skin from the inside-out and we make adaptive skincare by predicting what works for your skin. 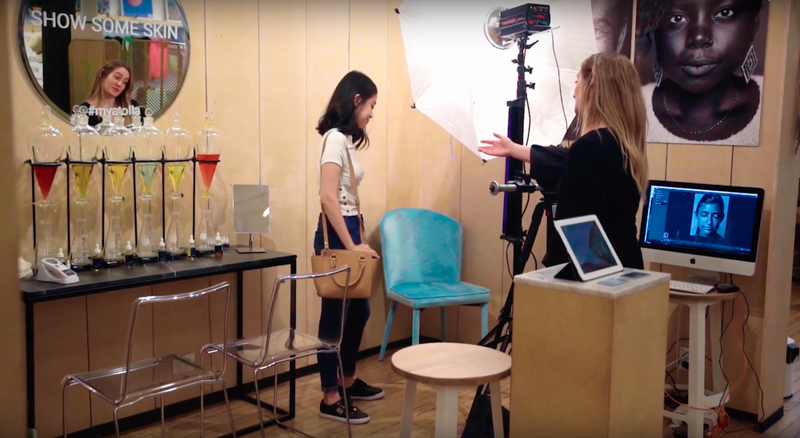 During five weeks this summer, over 500 New Yorkers visited the Skin Lab in Soho. They were amazed to learn more about how sun damage appears under the top layer of the skin, how the New York summer quantifiably changed their skin’s oil and moisture levels and what ingredients worked best for their skin - all in just 15 minutes! As our pop-up came to an end, so did our time in the MIT Delta V accelerator. We finished off our amazing summer by presenting our vision at Demo Days in Cambridge, NYC, and San Francisco. 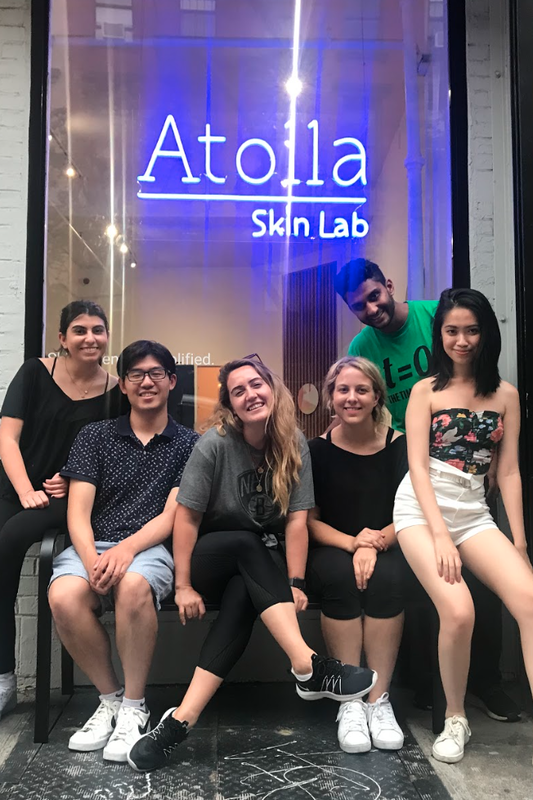 Thanks to the determination of our team, the incredible support from the MIT Delta V accelerator, and the hundreds of New Yorkers who visited the Atolla Skin Lab, the success of this summer has led to the development of our next stage: bringing the Atolla Skin Lab experience to you. We want everyone to have the opportunity to understand their skin by delivering the tools to analyze your skin at your own home, on your own time. Atolla is now taking pre-orders for the Atolla Skincare System, a customized skincare regimen and skin analysis kit to track your skin health. Along with a digital app, the skincare system allows you to understand the patterns in your skin, what causes your skin issues, and get the personalized solution to address them. We’re delivering a digital platform that tracks your skin like you track the rest of your health. Instead of playing the guessing game of why your skin is changing, the Atolla Skincare System will deliver you the answers. Finally, you will understand the causes of your skin reactions - what works for your skin and what doesn’t. Also, you can find people with skin similar to yours using the Atolla Skin Sequence, and discover what active ingredients and skincare routines are working for them! At Atolla, we’re delivering a digital platform that tracks your skin like you track the rest of your health. Atolla’s mission is to empower you to manage your skin health by understanding your unique, changing skin. By leveraging quantifiable and physical data, Atolla makes skin science simple and approachable. In the last week of July, we brought the Atolla Skin Lab to Nolita. Through an immersive pop-up experience, hundreds of New Yorkers with a deep diversity of skin types learned about their skin in an unprecedented way. Within fifteen minutes, they were able to understand their skin and create a personalized product on the spot. Instead of trying to fit into vague labels of “dry”, “combination”, and “oily”, Atolla provides an interactive experience to create a holistic picture of your skin. The Atolla Skin Lab accomplished this through 3 steps: a short intake survey, an analysis with a visual evaluation, and measurement of your dermal data. The intake survey allows us to understand your skin health from the inside-out by incorporating your micro-environment, age, skin concerns, lifestyle, diet, and current routine. Then, we use high-resolution UV photography to reveal any sun damage, texture, or discoloration beneath the skin and compare it to what’s on your skin’s surface. We use high-resolution UV photography to reveal any sun damage, texture, or discoloration beneath the skin and compare it to what’s on your skin’s surface. The final step of the process is to take dermal skin measurements, specifically hydration and oil levels in the Nolita pop-up. Our machine-learning algorithm incorporates this information to develop your distinct skin sequence. Based on your skin sequence, you are matched to an optimal ingredient combination. After testing how the matched ingredients feel and absorb, we save a preference profile for you. You walk out with a truly custom product, personalized down to the ingredient combination that suits your skin, your lifestyle, and your preferences. Most Atolla Skin Lab visitors made an appointment because they wanted to learn more about their skin; they left with a comprehensive picture of their skin across several attributes, as well as their preferences in choosing skincare products. UV photography was new to many visitors who were interested to see what was happening underneath the surface of their skin. 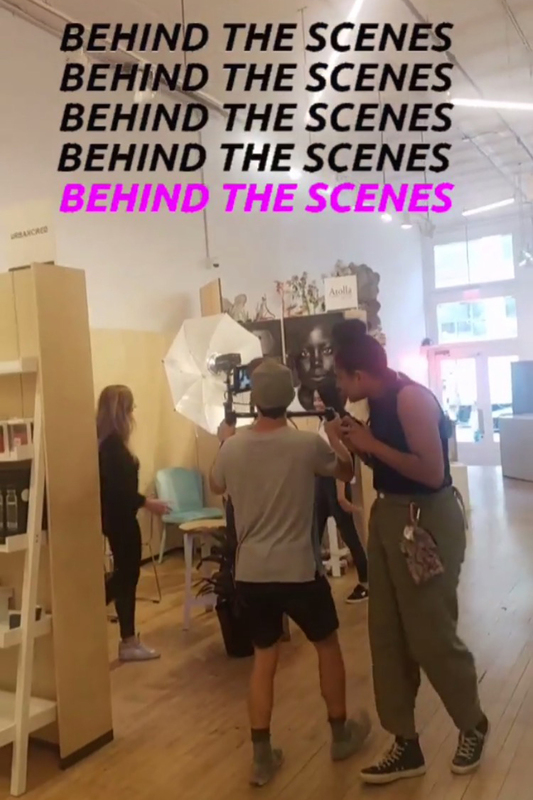 Even those who were skincare enthusiasts were excited to see their skin through the visual analysis, expanding their existing knowledge of their skin health. No matter if you are a skincare addict or just starting to figure out your daily routine, you will leave the Atolla Skin Lab learning something new. Due to the overwhelming interest in experiencing the Atolla Skin Lab - all of our appointments were pre-booked before we opened the doors in Nolita - we’re extending the Skin Lab through August at Canal Street Market. Book your appointment here and follow us on Instagram to see more #myatolla stories! Do you find yourself struggling to accurately describe your skin? The skincare industry commonly classifies skin as “dry”, “oily”, or “combination”, but these general categories do not reflect the complexities of each individual’s skin. For example, these categories miss how hydrated your skin is - people can have both dehydrated and oily skin - over 50% of Atolla customers in the Northeast had this type of skin in the winter. “Dehydrated” and “dry” are often thought to be the same, however- dehydrated skin lacks in hydration (making the skin feel tight) and dry skin lacks in oil (making the skin flaky). People that don’t fit into the standard buckets of “dry” or “oily,” are usually grouped together as having “combination” skin. This misconception causes people to try products that are not compatible to their specific skin, making their skincare routine ineffective. You shouldn’t settle for this. Misinformation, confusion and over-generalization are rampant in the skincare industry. Less than 10% of U.S. consumers have seen a dermatologist to diagnose their skin, leaving most consumers to self-diagnose and, in turn, choose skincare products based on incomplete or wrong information. Currently, skin classifications do not account for the various factors that have an impact on your skin. Your skin changes seasonally and geographically, as well as with other changes in lifestyle, diet, and hormones, making it futile to just use static, vague skin classifications. Without a nuanced understanding of your skin, finding the right skincare product for you is like rolling the dice. While turning to friends or the internet for advice can work, you shouldn’t have to - there has to be a simple way to get skincare that works for you. In order to have an accurate understanding of your skin, real and quantifiable data must be incorporated and measured over time. Developed at MIT, Atolla delivers a personalized, scientific approach to skincare. We help you understand your skin across several attributes and the many internal and external factors affecting your skin. We seek to provide you with an understanding of your skin that goes past current limited labels. We synthesize dermal data, visual skin analysis of skin issues, and environmental and lifestyle factors to complete your skincare understanding. Come visit us from July 25th - July 29th at our Nolita location (251 Elizabeth St) to receive a complimentary skin analysis. Based on your measurements, Atolla will develop a custom formulation tailored to your specific skin needs. Sign up for a Skin Lab appointment today. Understanding your skin can be complicated- we make it simple. Atolla is a MIT-based startup that empowers consumers to take ownership over their skin health through a simple 3-step process of “Analyze - Formulate - Track.” You will understand your skin using real, objective data, formulate a product specific to your skin, and track your skin health over time. Our proprietary machine-learning algorithm designs personalized formulations for your specific and evolving skin needs. People don’t know how to choose products that will safely work for their unique skin because skin is complex and it’s changing. We are removing the frustrating trial-and-error process of finding skincare that works for you. Meghan, our CEO, kept a skin diary for over a year to catalog how her skin reacted to each product she tried and knew there had to be a smarter way to experiment. Developed at MIT, Atolla provides a data-driven approach to skincare. 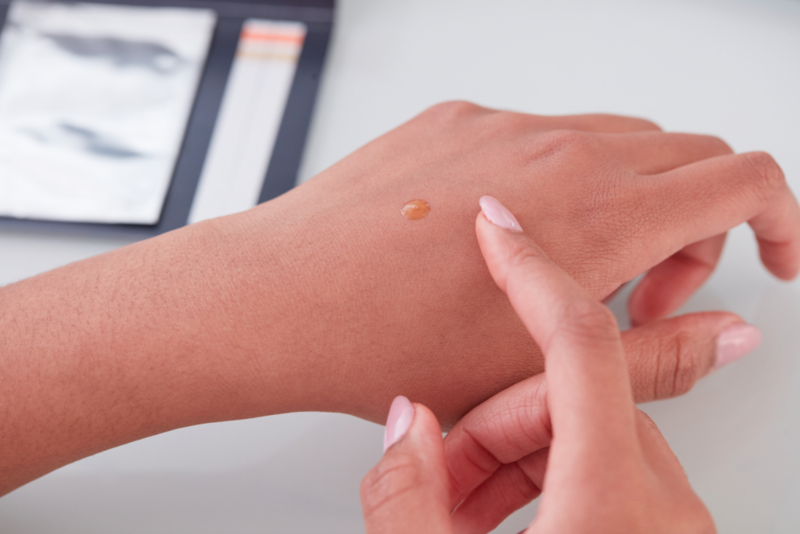 To help you understand your skin from the inside out, we look at your dermal data, visual skin analysis of skin issues, and environmental and lifestyle factors. Our current product offering uses all-organic and non-synthetic ingredients, is dermatologist-formulated, and is customized at the ingredient and dosage level appropriate for your skin. The idea born at MIT is taking shape in NYC. With our amazing team and the support of the MIT delta V accelerator, we are committed to transforming the skincare experience. Come visit us from July 25th - July 29th at our Nolita location (251 Elizabeth St) to see your skin in a new light at the Atolla Skin Lab. To learn more about Atolla check out our Instagram, Facebook, Twitter. We’re so grateful for our community here on Instagram and are excited that so many of you have been writing in with your questions, ideas and skin concerns!⠀⠀⠀⠀⠀⠀⠀⠀⠀ ⠀⠀⠀⠀⠀⠀⠀⠀⠀ We’re gearing up for our launch soon. If you’re using Facebook and Twitter, please give us a follow to help us spread the word. ⠀⠀⠀⠀⠀⠀⠀⠀⠀ ⠀⠀⠀⠀⠀⠀⠀⠀⠀ More #skindata = better recommendations and insights based on people with similar skin to yours. We really appreciate it!